Singapore is a serious melting pot for different religions and ethnic groups, especially Chinese, Malay, and Indian. Plus, the tiny island nation, which is a city-state, has one of the largest percentages of foreign workers in the world. With so many nationalities in one place, there's always something to celebrate! You can unexpectedly find yourself in the midst of a massive festival or street procession you didn't know was coming. Singapore is located extremely close to the equator. It's just 85 miles to the south of the city. You'll never be cold in Singapore unless it's because the air conditioning is perpetually cranked to the maximum inside of the many shopping malls. Museums and movie cinemas are even worse—take a jacket! Temperatures remain consistent throughout the year, with highs of 88 degrees Fahrenheit and lows in the mid-70s. 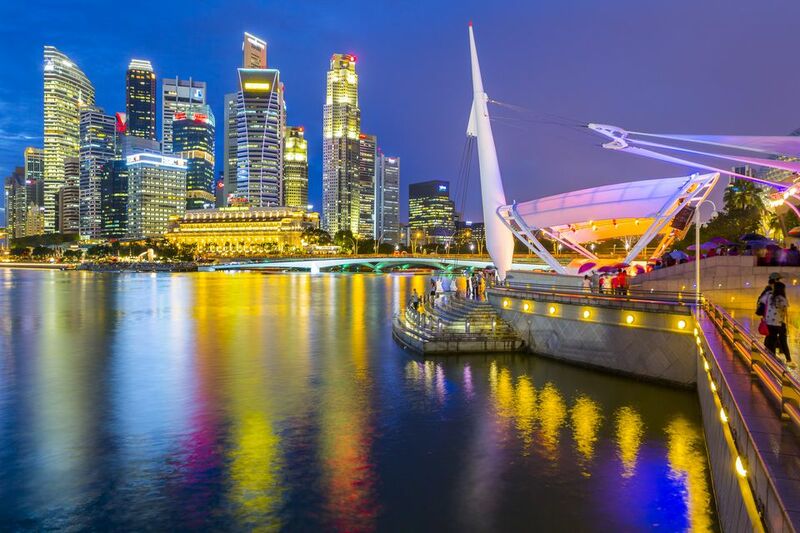 Many first-time travelers to Singapore are surprised to see so much green space and the abundance of walking trails. They were expecting a futuristic city where soulless concrete and moving sidewalks have replaced all greenery. But the island stays green for a reason: Singapore gets a lot of thundershowers. Unlike the rest of Southeast Asia where there is little to no rain during peak dry season, unexpected showers pop up often in Singapore. Fortunately, they usually don't last long, and the sun returns to raise humidity. The average humidity in Singapore is always above 80 percent. Rainfall is mostly consistent throughout the year except for additional rain in November, December, and January. Singapore experiences the wettest months during the monsoon season between November and January. Singapore averages 178 rainy days per year—that's nearly one out of two days a year with a bit of rain! Along with an interconnected matrix of shopping malls, indoor food courts, and local markets, there are plenty of world-class museums in Singapore to enjoy during passing showers. Singapore receives predictable haze and smoke annually from slash-and-burn agricultural fires that rage out of control in nearby Sumatra, Indonesia, just to the west. The pollution created by these fires is only one more example of how unsustainable palm oil plantations have become an ecological disaster. Despite an outcry from the government, the fires typically begin around May and can continue throughout the dry summer months. Changes in wind direction sometimes carry haze away as quickly as it came, so you shouldn't avoid visiting unless you already suffer from respiratory problems. On days when particulate levels rise too high, the air may irritate eyes and cause choking. Locals often opt to wear protective masks when the haze comes; you can get yours in any pharmacy. On some years, particulate levels in the air rise above "safe" thresholds, forcing some business closures. Travelers with respiratory problems should check the haze in Singapore website created by the National Environment Agency to see if haze is a severe threat. On some very hazy days in the past, residents have been advised to minimize outdoor time and remain indoors. Residents in Singapore enjoy 11 public holidays annually to accommodate the four major religious groups (Buddhist, Muslim, Hindu, and Christian). Some secular holidays such as New Year's Day (January 1) not associated with specific groups are also observed. Some festivals such as Lunar New Year span much longer than a single day, and locals request holiday time before or after to maximize time off. Businesses owned by specific ethnic groups may still be closed in observance, and travel may be affected. If a public holiday falls on Sunday, businesses will close Monday instead. The Ministry of Manpower sets the dates of public holidays in Singapore each year. Check their calendar if your time in Singapore is short. Many festivals and holidays in Singapore are based on lunisolar calendars, so dates change from year to year. As usual, traveling during big public holidays may be fun but expect higher prices for accommodation. Hotels often inflate rates for the increased demand, particularly during Lunar New Year. The worst-case scenario for visiting Singapore is to turn up just a day or two after a major festival. With poor timing, you'll deal with the crowds and higher prices without getting to enjoy the festival itself. The largest festivals affecting transportation and accommodation in Singapore are Christmas (yes, the one on December 25), Lunar New Year in January or February, Ramadan, and National Day. You'll find many smaller events, parades, and celebrations to enjoy other Asian festivals. Spring in Singapore kicks off the country's dry season, making it a mostly pleasant time to visit. Temperatures are usually around 76 degrees Fahrenheit. Singapore International Film Festival is the country's longest-running independent cultural event. It's held every April. In May, Singapore Airlines sponsors the Singapore Airlines International Cup. With a $3 million prize, it's one of Asia's richest horse racing events, attracting hordes to the Turf Club. Summer is Singapore's dryest season and one of the most popular among visitors, but you should consider air quality when you visit. Despite plenty of effort to curb the slash-and-burn agricultural practices in neighboring Sumatra, they continue, and the smoke and haze create poor air that quality chokes up locals and travelers every summer. Singapore Food Festival is a month-long celebration of food. The Great Singapore Sale is heaven for shoppers. From May through July department stores, malls, and individual boutiques offer incredible discounts and host late-night shopping events. Early fall sees a break in the tourist traffic that plagues summer. If you come early enough, you also can shop at the very end of the Great Singapore Sale. The Singapore Grand Prix is part of the Formula One World Championship. It's held each fall at the Marina Bay Street Circuit. Even February, often the driest month in Singapore, still averages eight days of rain. You'll see plenty of residents carrying umbrellas at all times; they're useful for both hot sun and unexpected rain. The Chingay Parade is a yearly street parade that takes place in February. The colorful ceremony celebrates the birthdays of the Chinese deities. ZoukOut, one of Asia's largest dance music festivals, takes place each year in December.